Although many doubt that the current administration will be listening to the arguments presented with an open mind and with a willingness to compromise, it’s still important that people who oppose this horrible piece of legislation make their presence known. We do not want to be remembered as the province that stood idly by as our government stripped its people of their rights. You can follow the proceedings here. 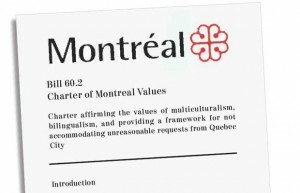 Published by Adrienne Piggott on 2014/01/14 at 19:00 under Quebec Charter of Values. 0 comments. Published by Adrienne Piggott on 2013/11/25 at 15:08 under McGill Content, Quebec Charter of Values. 0 comments. Published by Adrienne Piggott on 2013/11/22 at 16:51 under Quebec Charter of Values. 0 comments.